Last week I brought you the Cooker and a Looker Keeping Christmas Merry Menu plan. In the (terrifyingly few) weeks left until Christmas I’ll be bringing you easy recipes to help you keep your cool on the big day. Combine all ingredients in a small bowl. Allow to macerate in the fridge for about an hour. 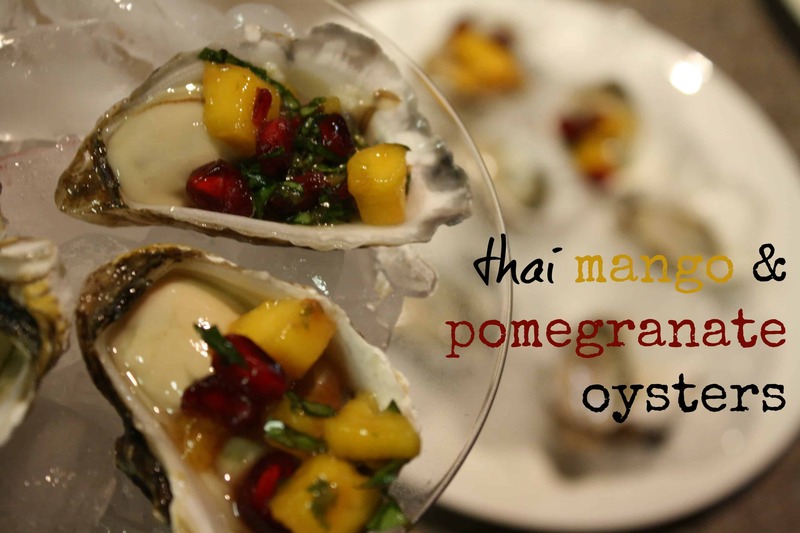 Arrange oysters on a bed of crushed ice and top with the mango & pomegranate dressing. Process/blend/thermochef the bread into crumbs. You need to make about a cup – this was three slices when I made it. Place the bread crumbs in a small bowl. Add melted butter, spring onions, garlic and combine. Season with salt and pepper. Arrange the oysters on an oven proof tray. I use scrunched alfoil to keep all the oysters standing to attention. Top the oysters with the garlic crumb and grill at medium-high for 2-3 minutes or until golden. Combine mirin, sake, rice vinegar and vegetable oil in a small bowl. Arrange oysters on a platter, spoon dressing onto oysters. Top with chopped chives and serve. 9 cherry tomatoes, very finely chopped. I used red, yellow and kumato tomatoes. Combine tomatoes in a small bowl, season with tabasco and sea salt. 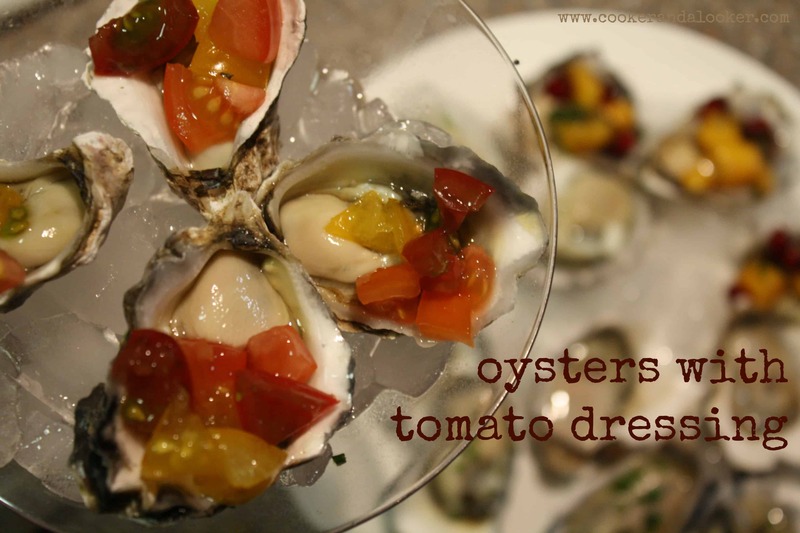 Arrange oysters on a bed of ice, top with the tomato mixture and serve. 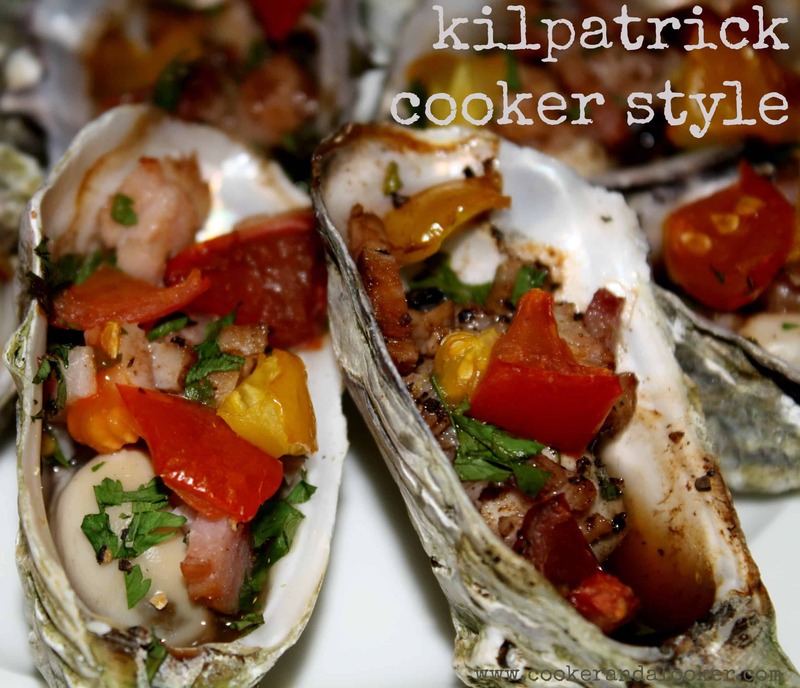 Sprinkle bacon, parsley and tomato over the oysters. Add worcestershire sauce and grill under a medium heat until the bacon is cooked (6-8 minutes in the oven of certain mediocrity). If you’re feeling fancy-pants you can serve the oysters on a bed of coarse sea salt, garnished with lemon wedges. This is my husband. 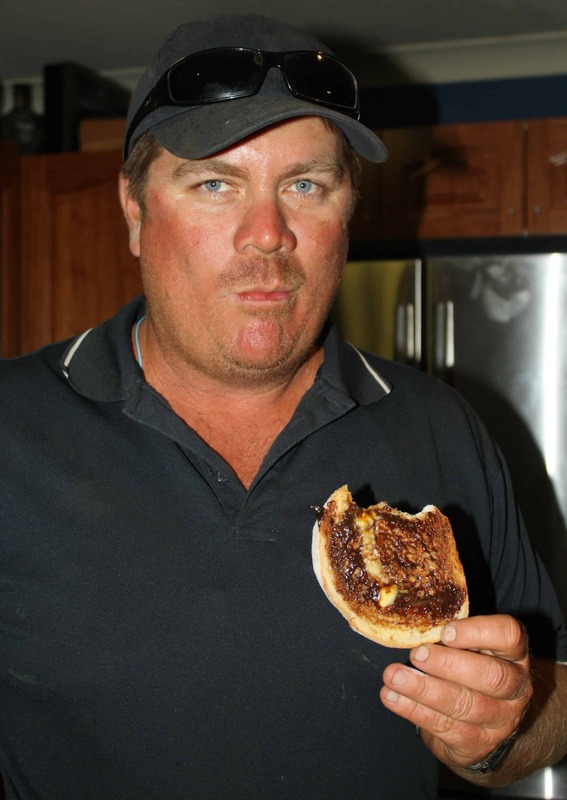 He’s tucking into vegemite on pane di casa, because he’s starving and I won’t let him tuck into any delicious oysters until I’ve finished photographing them. Luckily he’s a very patient man! Disclosure: This is not a sponsored post. Baker’s Delight sent me the pane di casa I used for the garlic crumbed oysters along with some other Christmassy goodies, including a Christmas cake that I’ll be using to make some rum balls – stay tuned. All opinions and recipes are my own. Furthermore, while we’re getting things off our chests….in the real world, I much prefer my martini glasses to be filled with, well, martinis. I only put oysters in them for this post because I was trying to be a clever clogs. Oh yummo! I love oysters. I’m going to make the mango and pomegranate ones this weekend. Legend! That first one looks amazing and fabulous. That’ll do me nicely. I am the only one int he family who eats oysters and I do like them but they’re a rare treat. Oh u tease. 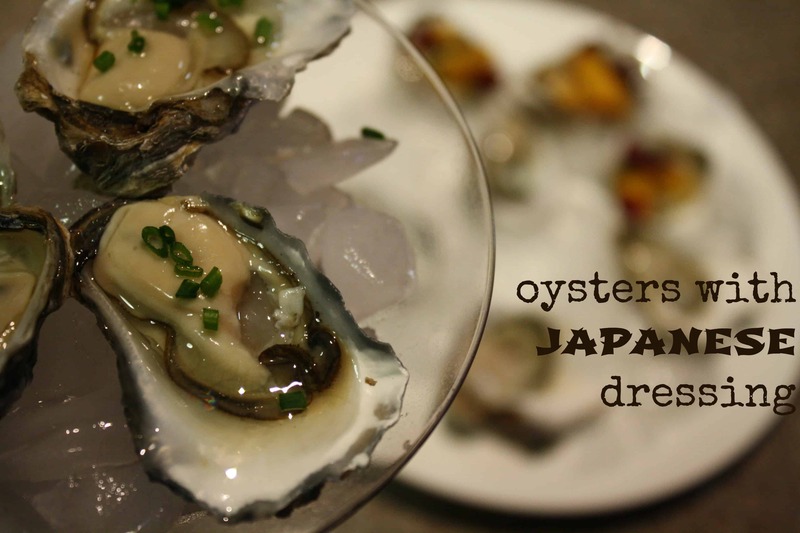 I just love oysters any way they come – natural or exotics like you’ve done. The pics are excellent. Love, love oysters in this house. Thanks for the divine recipes! I tried oysters once and didn’t enjoy it at all. Caution Claire: my husband is not a fan of raw oysters and he wasn’t brave enough to sample any of the dressed oysters. He found the garlic crumb insufficiently broiled for his liking. Maybe start off with the Kilpatrick – lots of taste and texture distraction there!